Maximum quality requirements apply to the manufacturing and production of our medical partners and are subject to extremely high quality standards. The production takes place in the U.S. and Germany. 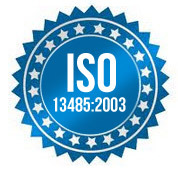 All our products are audited and certified according to the certification according to EN ISO 13485:2003. You have any special requests? Ask us! You have a space problem? On request, we store your order for you. In a call to 14:00 clock the dispatch your goods the very same day. We also repair other makes of your surgical equipment, drilling shafts and all pneumatically driven machines cheap, fast and reliable.